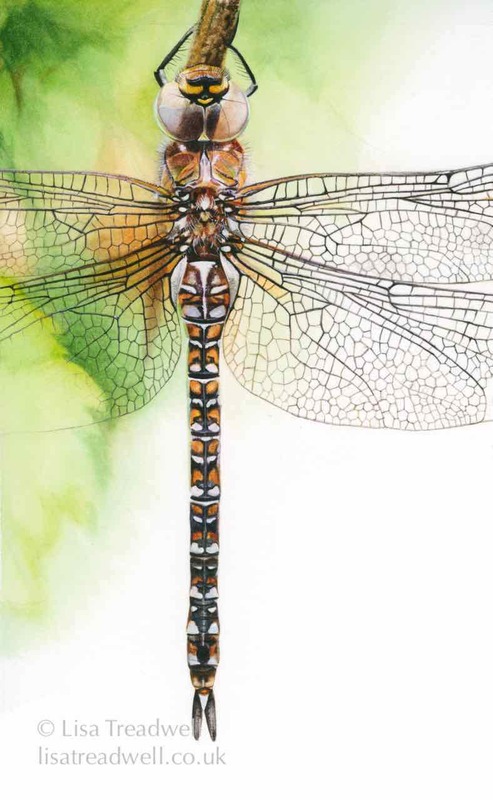 A stunningly colourful dragonfly. Inquisitive and bold, the males will often hover right in front of your face before continuing their patrol. 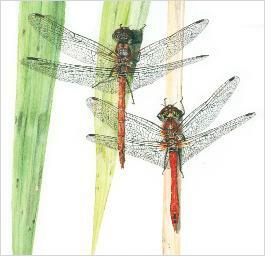 The painting shows both a mature male (top) and female. 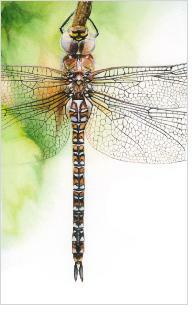 This female Migrant Hawker was spotted resting in a hedgerow one late August afternoon. 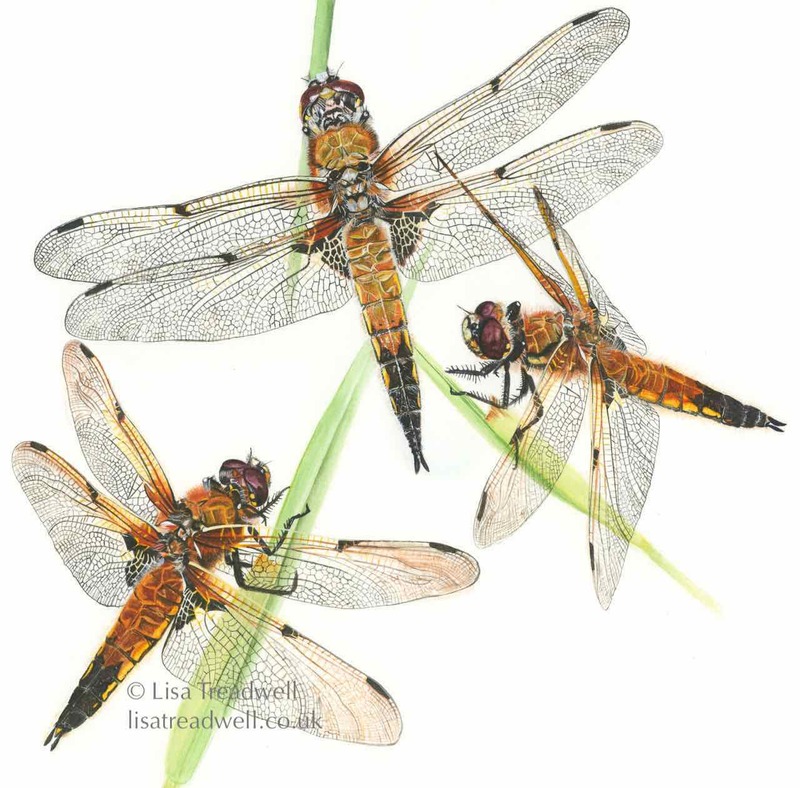 Continental migrations of this species boost our population numbers & clouds of these dragonflies can often be seen feeding together in sheltered spots. 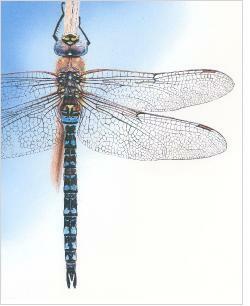 I was lucky enough to get close to this stunning male migrant hawker when it landed low down on the edge of a reed bed. Fully mature I decided the magnificent blue of its markings deserved emphasis with a simple design. 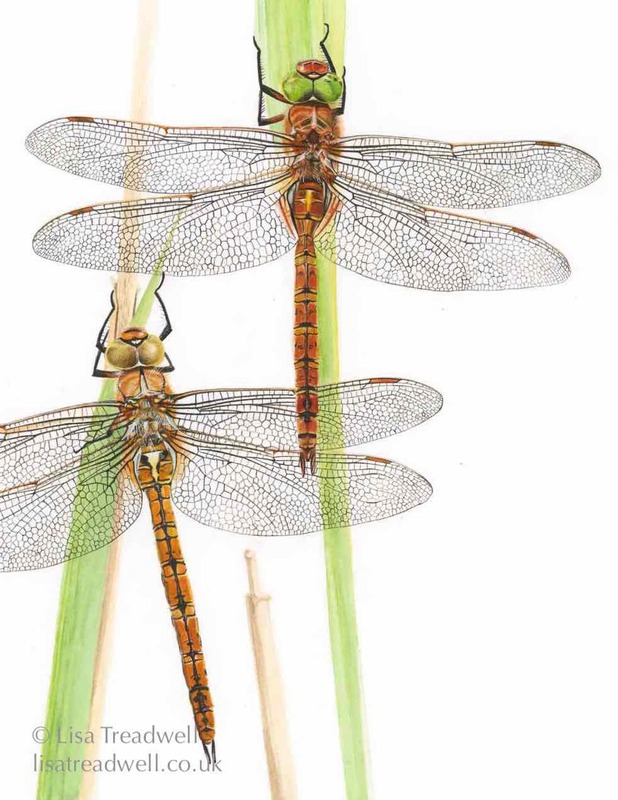 This painting shows a male (top) and a female, both with characteristic green eyes and the yellow isosceles triangle at the top of the abdomen. 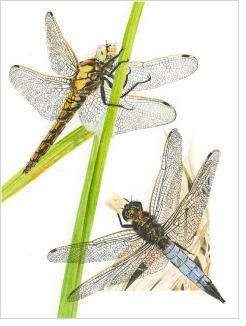 During periods of hawking these dragonflies will often stop to rest in the reeds. This rare species was until recently restricted to the Broads, but as its population has increased with conservation of its habitat it is beginning to disperse to other areas. This male was patrolling a pond in a dune system, periodically stopping to perch on a twig from which it can observe its territory. A widespread species occurring in a variety of habitats and often in plentiful numbers. The individual top and centre was found at a tarn in the Lake District. The other two in the Norfolk Broads. The male with his black tipped abdomen characteristically perches on dead vegetation next to the water. 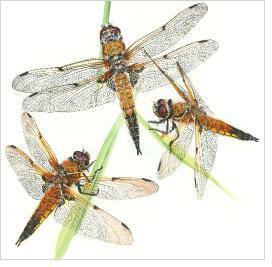 The female was found perching in a meadow next to the wetland habitat of How Hill in the Norfolk Broads. 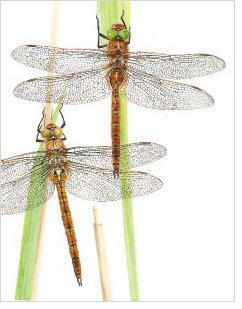 Easily confused, the ruddy darter is on the right. I wanted to compare the males of these two species. The rich red colouration is complemented well by the green of the reed in a striated composition. 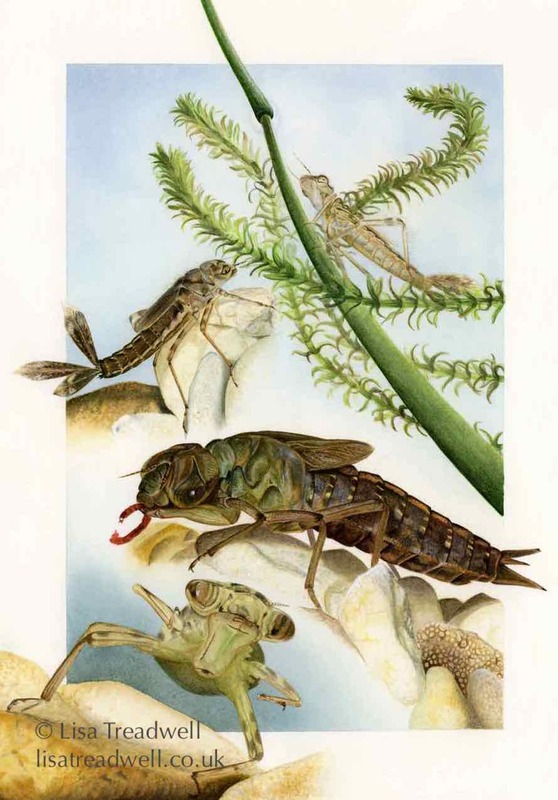 Voracious predators, dragonfly larvae lie in wait and ambush there prey, large eyes pick up on movement around them and an extending labium is able to shoot out in a split second to cease pry with piercing pincers. 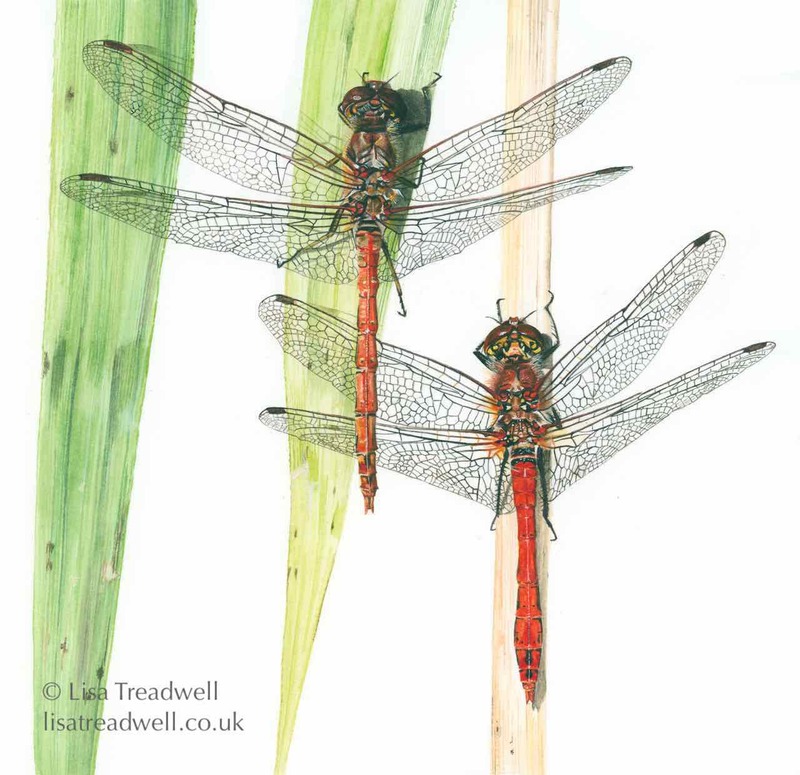 The two larvae above are those of damselflies with three leaf like caudal lamellae that absorb oxygen. 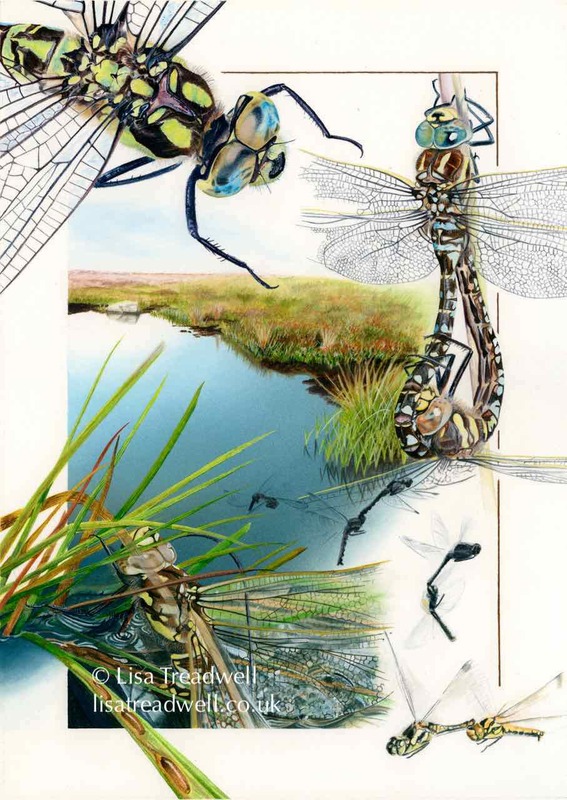 The two below are those of a common hawker dragonfly, the darker one probably in it's final instar before emerging into an adult. 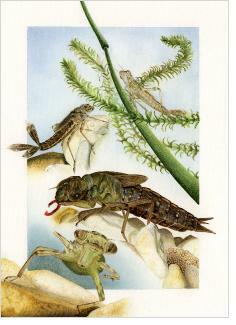 Bottom left an earlier instar of the same species, paler in colour due to having just molted its skin to accommodate new growth. The larva at this stage is itself vulnerable due to the pale colour and a soft body. 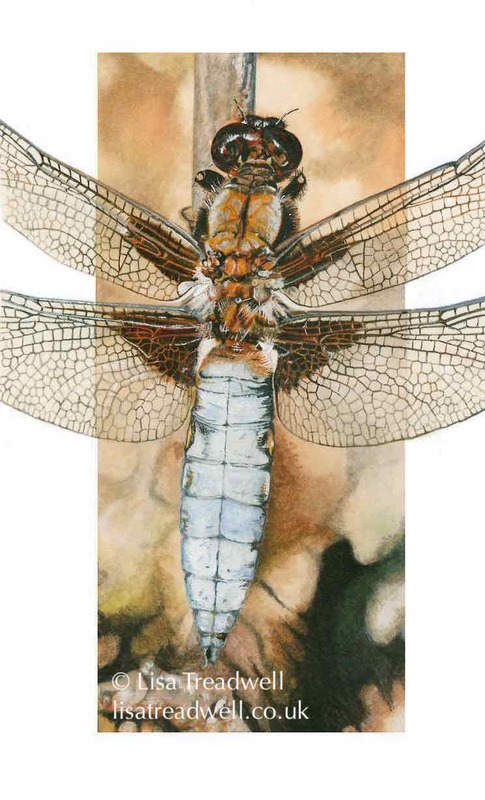 This painting shows the emergence sequence of a Black Darter dragonfly, with a detail of its habitat. 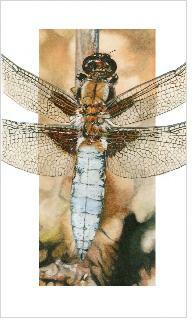 Fully formed within the larval skin the dragonfly crawls from the water. Splitting the larval case the dragonfly pushes its way free. 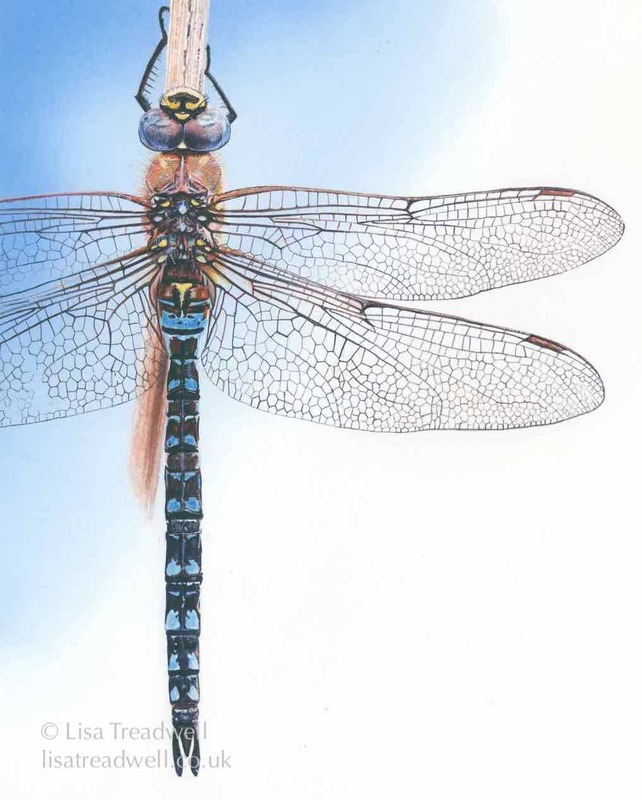 The wings and abdomen expand. The wing veins harden ready for flight into its new aerial life. 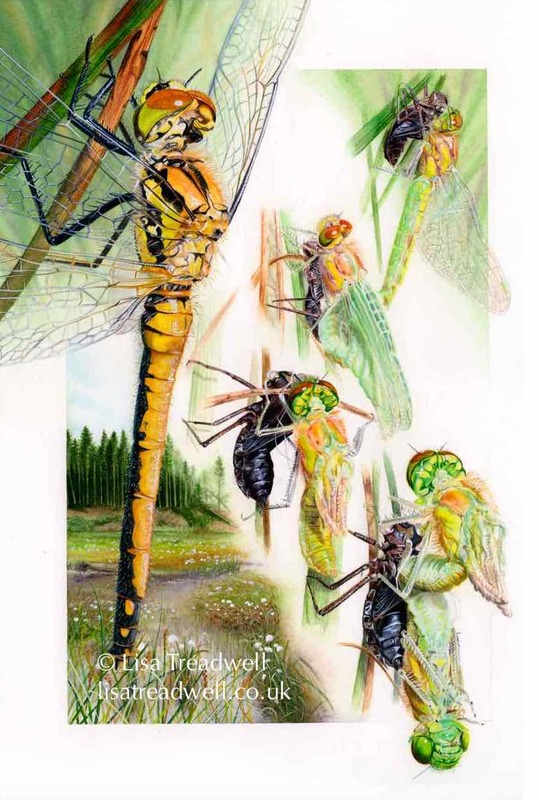 This painting shows the adult (imago) stage of the dragonfly life cycle. 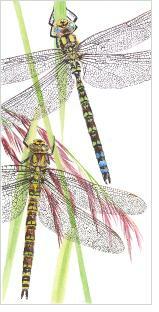 Southern hawker, Aeshna cynea top left. 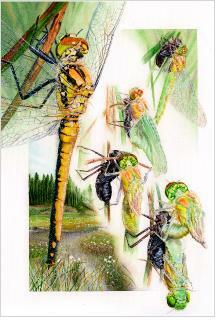 Common hawker, Aeshna juncea in the mating wheel top right. 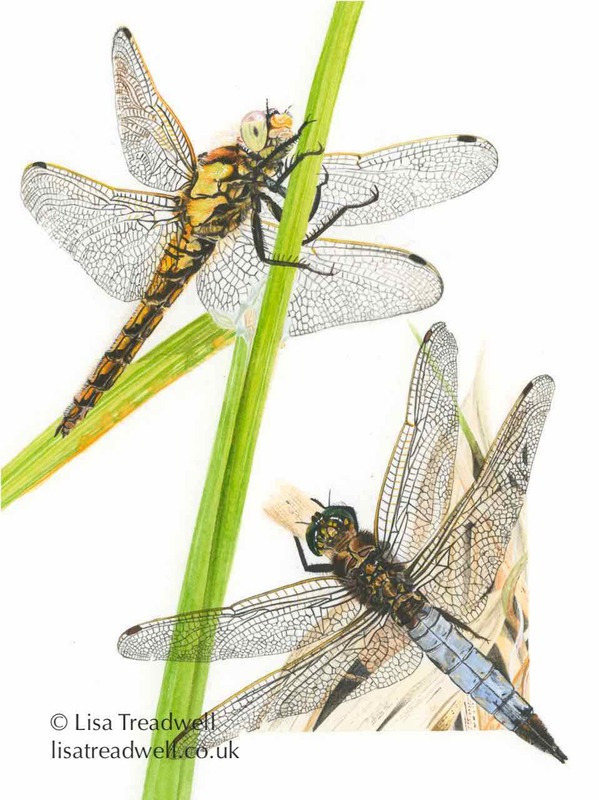 The female of Aeshna juncea bottom right laying eggs into the stems of cotton grass and a pair of black darters, Sympetrum danae in tandem as the female deposits eggs by flicking her abdomen. 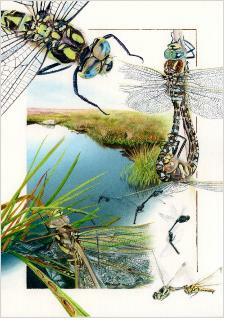 The landscape is a pool on the West Pennine moors in Lancashire, habitat both the common hawker and black darter are adapted to.